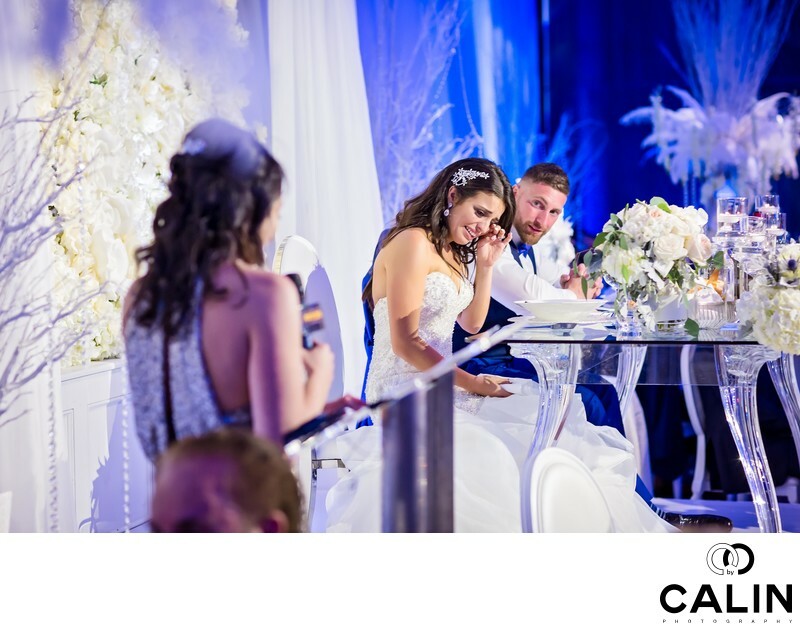 The special event at Château Le Parc was peppered with beautiful emotions ranging from laughter and to tears and everything in between. When the bride's sister approached the podium to give a speech, I knew I will have the opportunity to capture some of the most beautiful moments of the wedding day. The girls had a close relationship and when the younger sister told stories about their childhood, the bride started crying. To take this photograph I placed myself in such angle so I can capture both the speaker and the bride's reaction. I find that catching two stories in the same frame is conducive to a more powerful image. Here, the speaker is facing the bride but we can clearly discern she's her sister. Placed in the foreground she gives the image dimension. Also, the speaker is looking towards the married couple and she is out of focus so the viewer's attention is directed towards the bride and groom. Also, the wedding venue had a spotlight on the married couple so they are the brightest part of the scene. It is the human nature to look at the brightest spot in the frame so as a professional wedding photographer I always try to make the subject at least one stop brighter than the backdrop. That is always the case unless I want to photograph a silhouette. To create this beautiful candid photograph I used a 35mm lens and a Canon 5D Mark three camera.